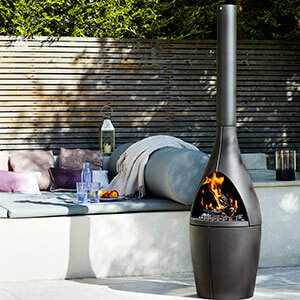 The Morso Kamino Outdoor Fireplace is shaped in cast iron and can - in addition to decorating and warming all outdoor spaces - also extend the use of the patio, so that it can be used from early spring, on cool summer evenings and on into the early autumn. Morso Kamino is moveable and can be turned in relation to both wind and arrangement. The Tuscan grill fits into the Kamino, so you can grill over the fire.